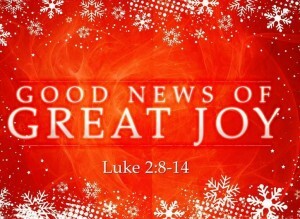 The Angel promised “great joy” would result from the good news. Notice that Luke 2:10 says more: “…the angel reassured them, ‘Don’t be afraid!’ he said. 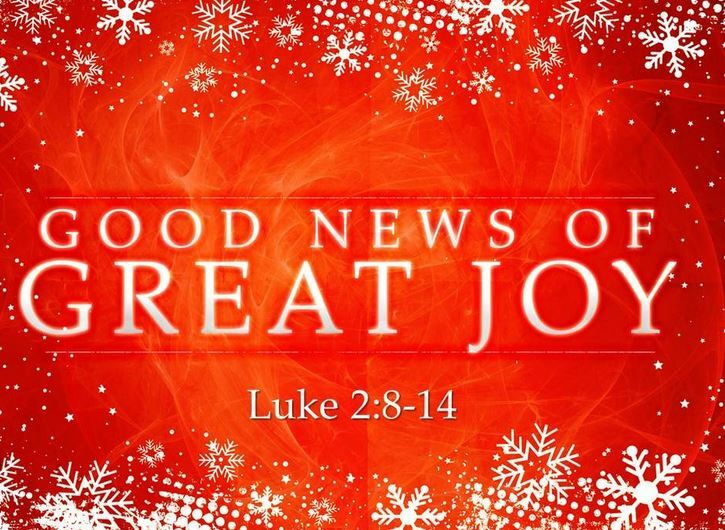 ‘I bring you good news that will bring great joy to all people.’” It’s not just for an elite few with some defining, distinctive characteristic. It’s for “all people.” It’s interesting that not “all” people take the same joy from Christmas that some do. I’m no “Scrooge” but I’m not nearly as excited and joyful about the season as my wife is. I get some joy just watching her enjoy it. Thanksgiving weekend kicked off the decorating season! We have two trees this Christmas; one in the front room and one in the basement. I can remember Christmases where we had four trees. They are not all the same size but they are nonetheless trees! Most years she puts the tree up by herself and sings along with Bing Crosby and other old crooners on CD. She does a wonderful job. If she will let me, I’ll supervise! She hangs wreathes on the door and wraps lights around the bushes and puts angels on the counters and… well, you get the idea. I’m in charge of the outside of the house. I happened to find someone who will do that for me. So I have it contracted that every year he comes to our house, this year right after Halloween, and brings the lights with him! He hangs my blue lights from the front gutters and I’ve done my part – Bah! Humbug! The whole world is divided between those who put a star on the top of their tree and those who put an angel on top of the tree. On the top of our tree is a star. It’s beautiful, but sometimes I wish we had an angel. I think we used to have an angel at one time, but since I’m not in charge of the tree, I don’t know what happened to it. Jim Wilson summarized this when he wrote, “Both are beautiful reminders of the Christmas story, a story that brings more than a warm feeling of family togetherness and seasonal joy—a story about how God became man and brought Salvation into the world.” The angel represents the one pronouncing the good news in Luke 2. The star represents the star of Bethlehem which led the way to Christ in the manger. Both are symbols of the great joy we experience at Christmas time. Be sure to take great joy in your family, take joy in your traditions, take joy in the music, take joy in celebrating, take joy in time off and most importantly take “great joy” in the sheer wonder that God became man, born of a virgin, in fulfillment of prophecies. And that He was born to die, to take away the sins of the world.